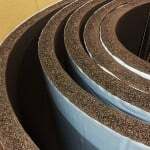 Interstate Specialty Products die cuts thermal insulation made of closed-cell EPDM foams for high-temperature applications such as HVAC systems and electronic equipment. Using precision die cutting, we convert rolls or sheets of thermally-insulating materials into custom components. Interstate can also apply pressure sensitive adhesives (PSAs) so that your thermal insulation is ready-to-install. Thermal insulation reduces the transfer of heat between objects with different temperatures. By controlling heat gain or heat loss, thermal insulation materials control system temperature levels, promote energy efficiency, and prevent or reduce condensation. Thermal insulation can also reduce the risk of fire. Interstate die cuts this custom insulation to tight tolerances, and in a wide range of part sizes. Die-cut thermal insulation from Interstate can also impart resistance to moisture, weather, oils, and ultraviolet (UV) light. Laminates can be applied for enhanced heat reflection and durability. In applications where thermal insulation comes into contact with dirt or process fluids, coatings that make surfaces easier-to-clean may be used. Interstate Specialty Products die cuts flexible EPDM foams such as HT/Armaflex®, an elastomeric material that combines heat resistance with outstanding durability, low maintenance and repair costs, and UV resistance. Made by Armacell Enterprise GmbH & Co. KG, this closed cell foam has a built-in water vapor barrier to reduce the risk of corrosion under thermal insulation (CUI). Interstate also die cuts closed-cell EPDM foams such as Aerocell, a lightweight elastomeric material made by Aerocell USA, Inc. This UV and moisture-resistant thermal insulator is supplied in sheets of various thicknesses that are ready for conversion. Depending on your requirements, precision die cutting runs can range from dozens to millions of parts. In addition to HVAC systems and electronic equipment, die cut thermal insulation is used with consumer and commercial appliances, ground vehicles, and aircraft. 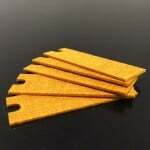 Die-cut thermal insulation is also used to insulate chillers, vessels, and tanks. With its thermal efficiency and non-corrosive properties, die cut thermal insulation is also used to insulate large-diameter pipes. 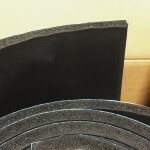 Is die cut thermal insulation made of closed cell EPDM foam the right choice for your HVAC system, electronic equipment, or processing facility? Interstate Specialty Products die cuts thermal insulation materials and supplies custom thermal insulation with or without pressure-sensitive adhesives. To learn how we can help you, contact us on-line or call (800) 984-1811.